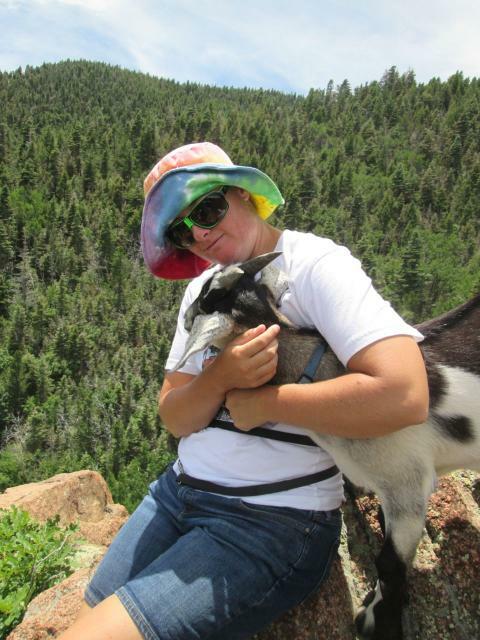 I recently got the calendar contest results back from the Colorado Dairy Goat Association, and Cuzco will be featured again this year! I submitted the photo I took of him at this year’s Rendy. Cuzco is such a stud! I was very pleased that out of the maximum ten photos I submitted to the contest, they chose from all of them the one of Lilly. 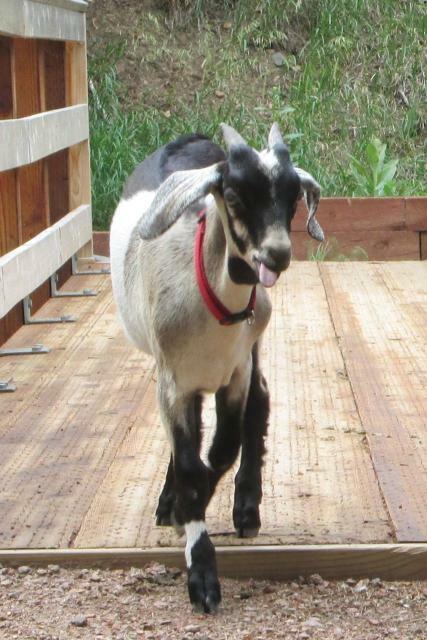 RIP dear Lilly-goat. He’s named in honor of the recent first close-up photographs of the most distant member of our Solar System. He’s a little forlorn right now and I keep hearing him cry and howl, but hopefully he’ll settle in soon. 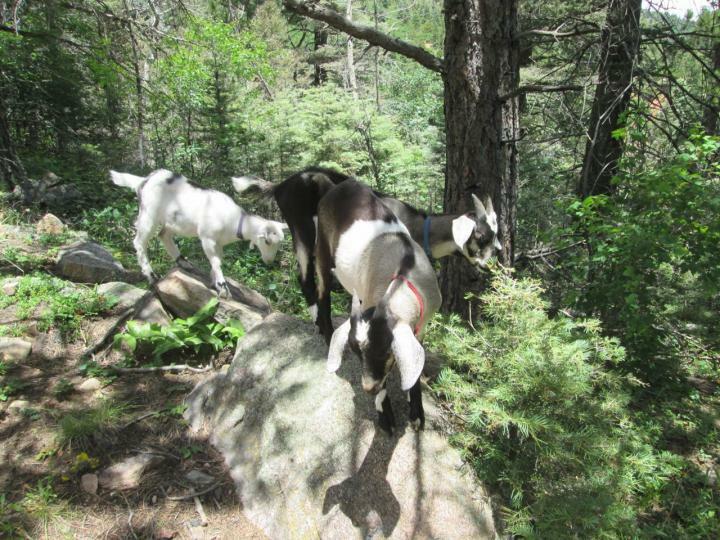 Pluto was curious about the goats at first, but the moment he went to greet them they all went into panic mode and it was contagious. 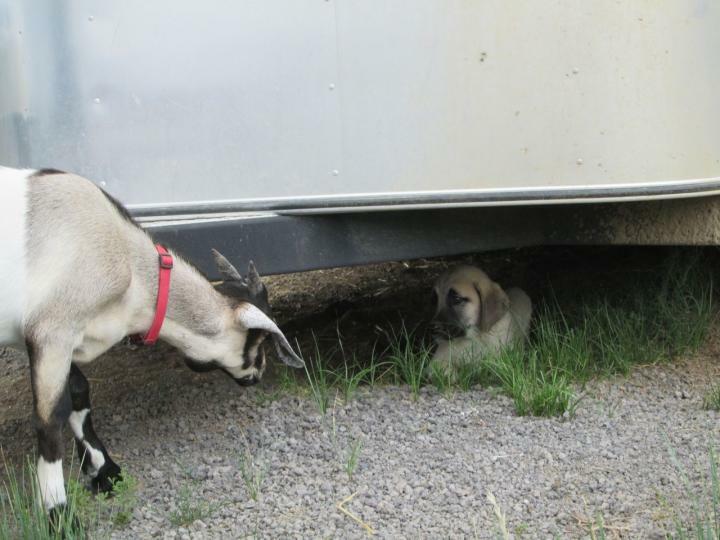 Now the goats and puppy are terrified of each other. 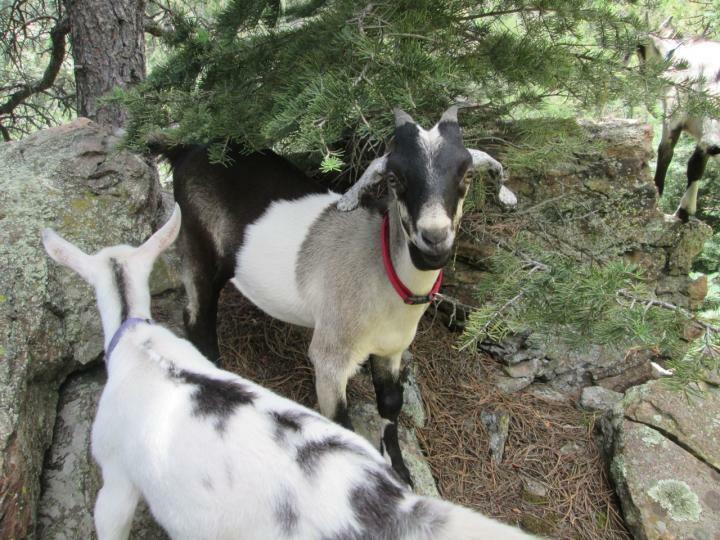 The goats magnetized into a tightly-packed goat block any time Pluto crept out from beneath the horse trailer he hid under all day. 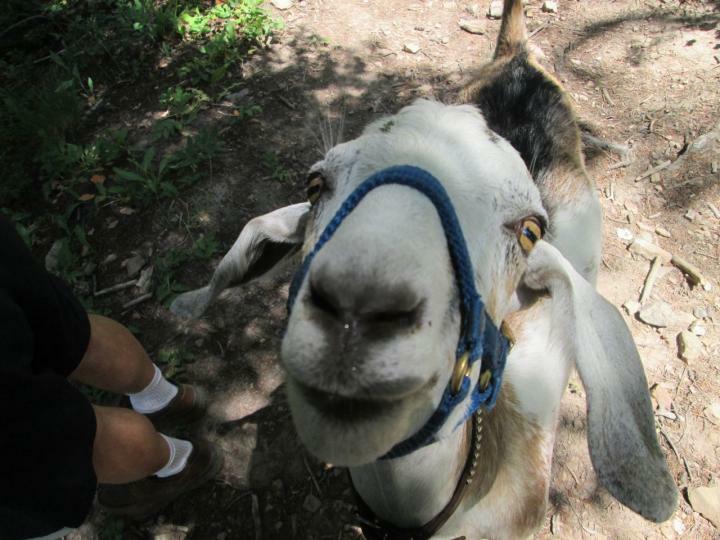 This is about as close as any of the goats came to saying “Hi”. 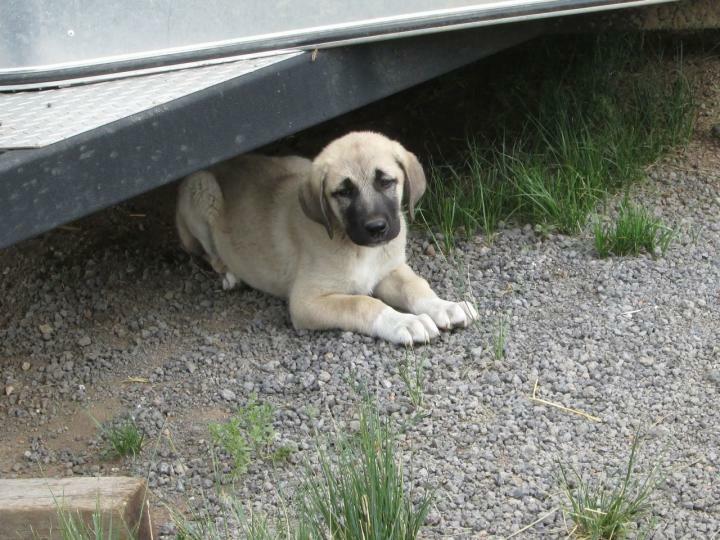 Pluto is an Anatolian Shepherd, and we got him because we’re not sure what our dear Daisy’s future holds. She has had mystery health problems since April and three different vets haven’t figured out what’s wrong. The trouble seems to be in her hips and back, but there is no actual joint problem anyone can find. We’ve had x-rays taken and we had her on anti-inflammatory pain killers at first, thinking maybe she’d been trampled by one of the horses. But she got worse so we went back to the vet. The lameness moved from leg to leg so we thought perhaps we were dealing with a tick-borne illness and put her on a four-week course of antibiotics back in May. It helped a lot and she was almost back to normal until late June when she went lame again. We put her on a different type of antibiotic for two weeks with no effect, and now we’re back to the one that seemed to help the first time. She’s been back on this one for one week and so far she’s still getting progressively worse, so I’m not confident we’re going to beat this thing. She’ll be getting blood work done this week and I hope we can figure this out and make her better, but Phil and I decided that if this is the end of the line for Daisy, we’d better get a pup ASAP so she can start training it while she’s still able. So far she’s doing a good job. She’s polite with Pluto (I think she secretly loves him) but she’s trying to maintain a cool detachment until he knows who’s boss around this place. She can’t fool me! Still, she’s doing a good job as disciplinarian. Pluto tried to eat from her food bucket and Daisy snapped and snarled at him. After one meal, I couldn’t even feed him from her dish after I put her out of the pen. I had to get him his own fresh bowl from the kitchen because he’s terrified even to clean the bottom of The Big Dog’s bucket. I’m very pleased that the pup is inspiring Daisy to finish her food. I’ve had a hard time getting her to eat enough recently because she doesn’t feel good and she’s dropping weight badly. With Pluto hovering near her food bowl, Daisy is determinedly forcing down every morsel. This afternoon, Phil and I took all three of the little scalawags for a hike together. They were awesome, and no one cried for mommy or tried to take themselves back home. This was Tigerlily’s first time away from Mama, and she did great! She’s quite the little explorer! The boys were behind me and kind of dawdling along and eating tasty things along the way, but Tigerlily was glued to Phil for the first half of this hike. Hammer is King of the Rock! Keep rockin’ that double chin there, dude. We came to a lovely rock outcropping with an incredible view of the eastern plains. We could even see our tiny speck of a house far below. The babies loved the view and kept giving me heart palpitations as they scampered as close as possible to the cliff edge. Tigerlily was particularly bold. She must take after her daddy,Finn, and her grandmother Lilly. 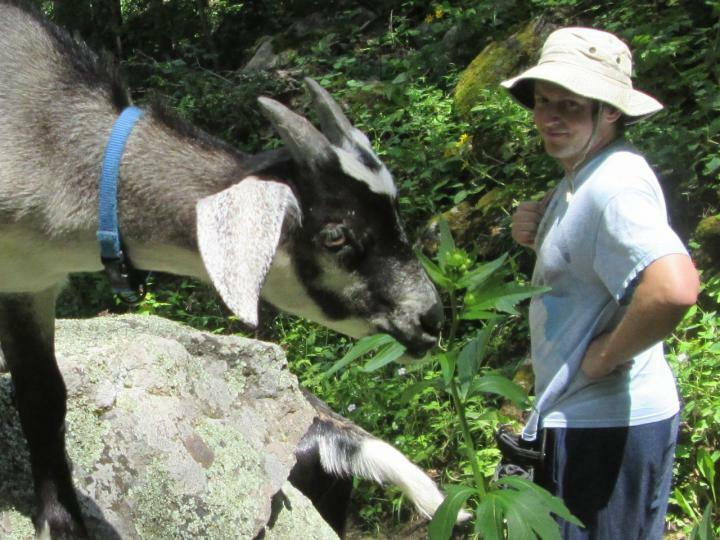 “There’s nothing more relaxing than having pleasant conversation with a goat.” That is the line I used for a photo of Cuzco and I conversing on this very same rock eight years ago. 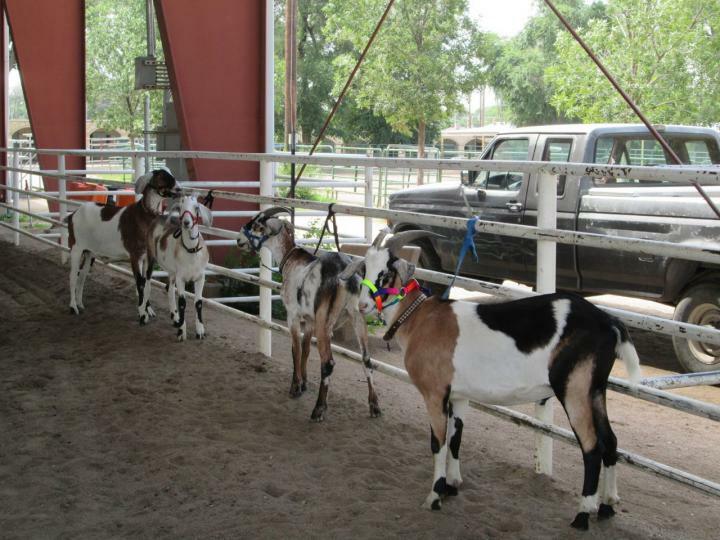 Phil and I were invited to set up and judge the annual Pueblo County 4-H packgoat show, so yesterday we packed up a bunch of obstacles and four of the boys and headed to the State Fairgrounds. Unfortunately, due to scheduling conflicts and miscommunication between two of the show administrators, the show basically got called off. I was not aware of any of this “behind the scenes” rigamarole, so Phil and I set up a really nice obstacle course and waited while no one showed up! So we took the boys and practiced the obstacles ourselves. Pac-Man was stubborn about this narrow bridge at first, but he eventually got into the spirit of things. A few people did trickle over after a while, and one boy brought his young market Boer, but the competition was a bust. 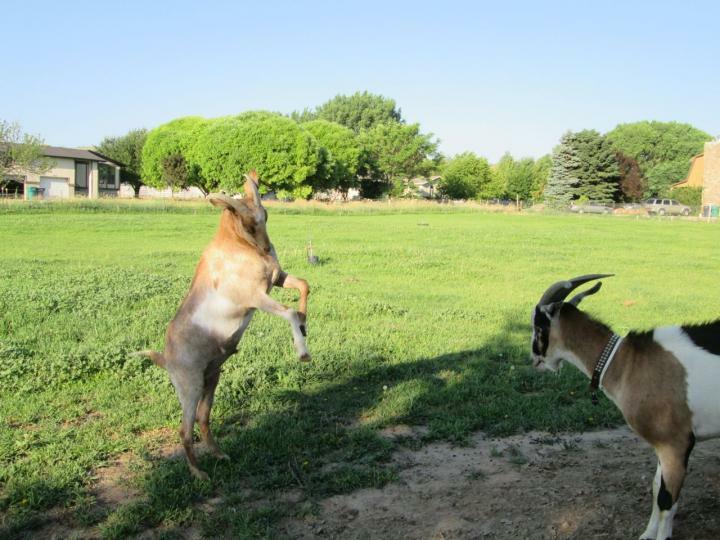 So we had fun with the Goat-O-Rama boys instead! I had brought them partly for the experience and partly so that anyone could compete who may not have had a goat of their own to show. We gave everyone a goat to play with and Phil and I gave out tips and pointers as the kids guided their charges through the obstacles. 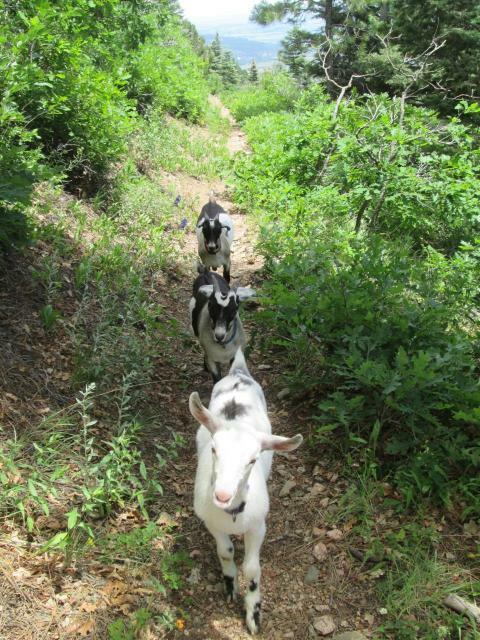 The most difficult obstacle on the course was probably also the most practical, and one our own goats were not trained for. 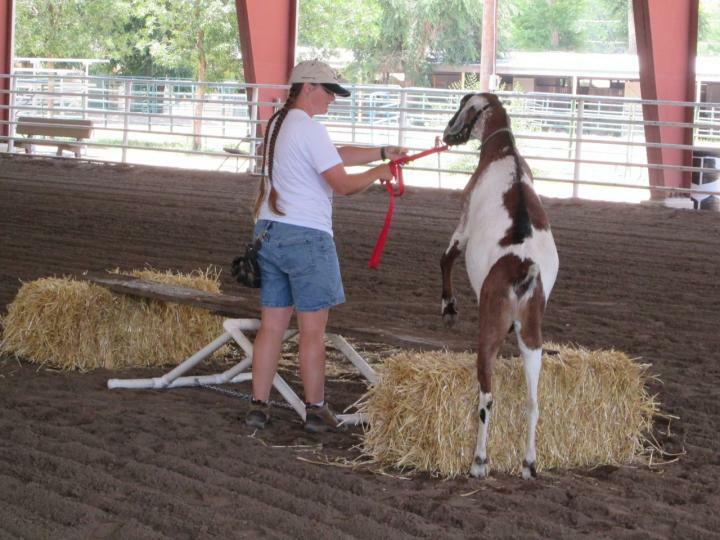 This was the “Rainstorm on the trail” simulation where you got to demonstrate your goat’s calmness and ground tying ability. 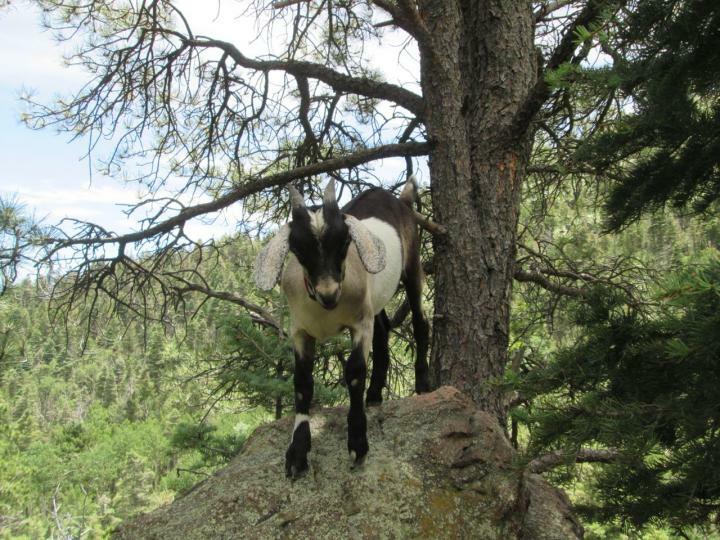 The only goat in my herd who knows “Woah” well is Cuzco, and he wasn’t with us yesterday. Pac-Man sort of knows the command when he feels like it, but yesterday he wasn’t in the mood. No one else even remotely stood there, so we got a lot of laughs and had to do a few round-ups. We also set up a “Stepping Stump” obstacle which Pac-Man flatly refused even to try (“I’m much too big for this!”), but all the younger boys loved it. Finn had THREE handlers at one point! He felt like a lucky, lucky boy to have so many girls paying attention to him all at once! 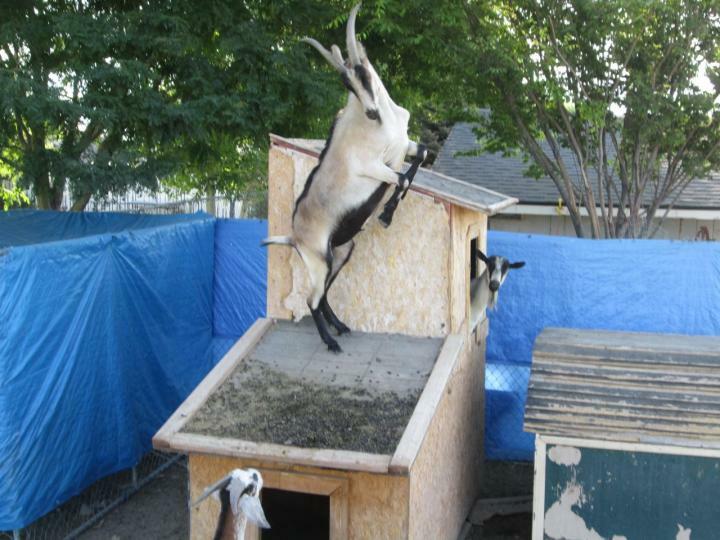 My favorite obstacle and the visual centerpiece of the course was the “Campfire”–a tantalizing gauntlet “booby trapped” with all kinds of scrumptious goodies that goats were not allowed to touch! 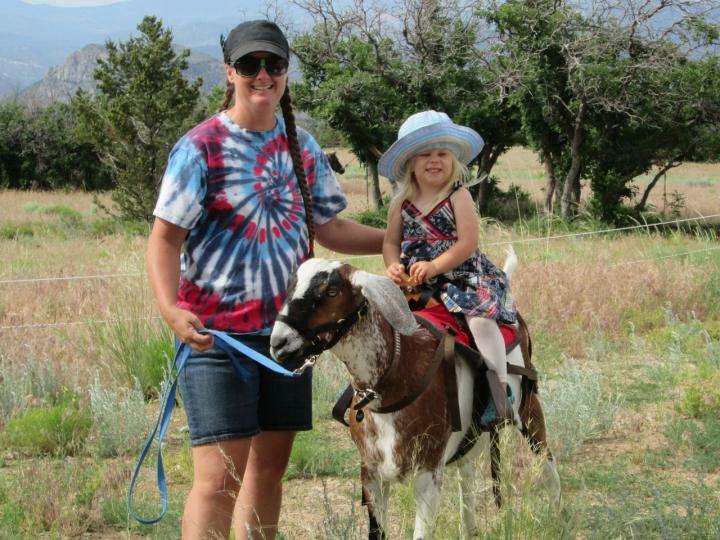 So even though the “show” never materialized, we still had a great time with our goats and with the few kids that did show up. 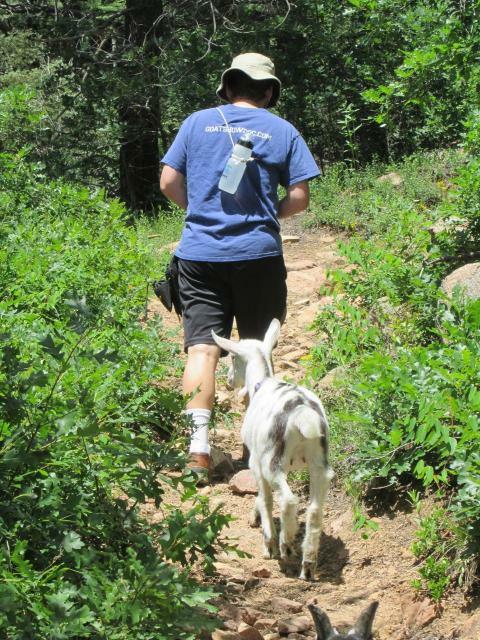 Kids and goats alike had a blast, and I was even able to get contact info for a few folks who may be interested in helping me get up a packgoat club in our area. 1. Jump – It was low at one end and high at the other. 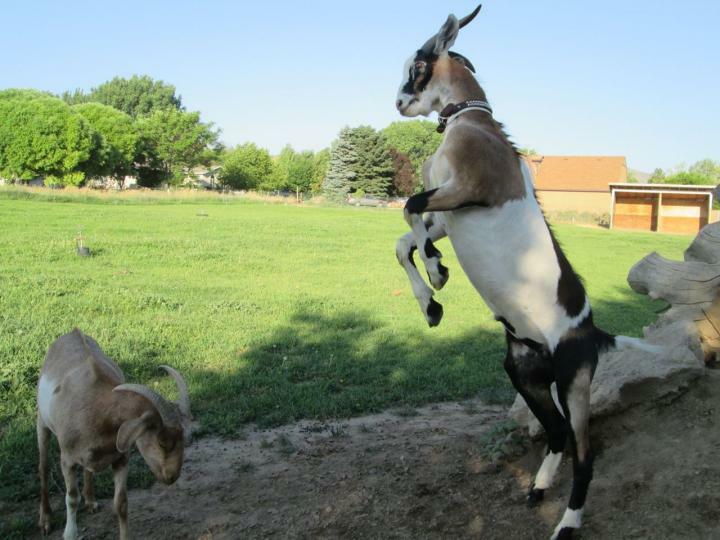 Bonus points for a goat who can jump the high end. 2. 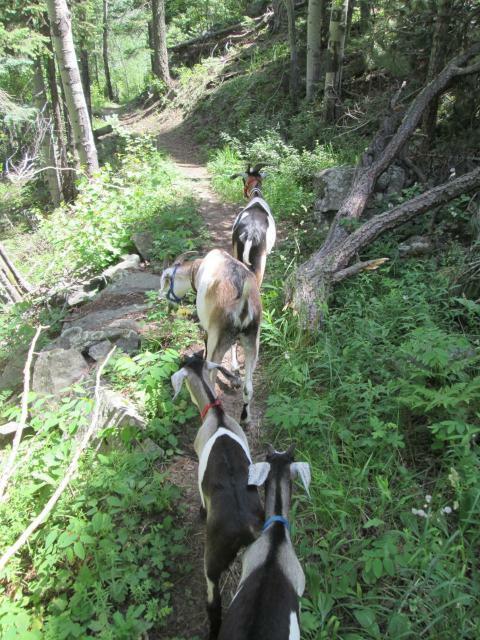 Rainstorm on the trail – Trot your goat from the jump to the far cone (demonstrates obedience to halter commands and willingness to follow quickly). 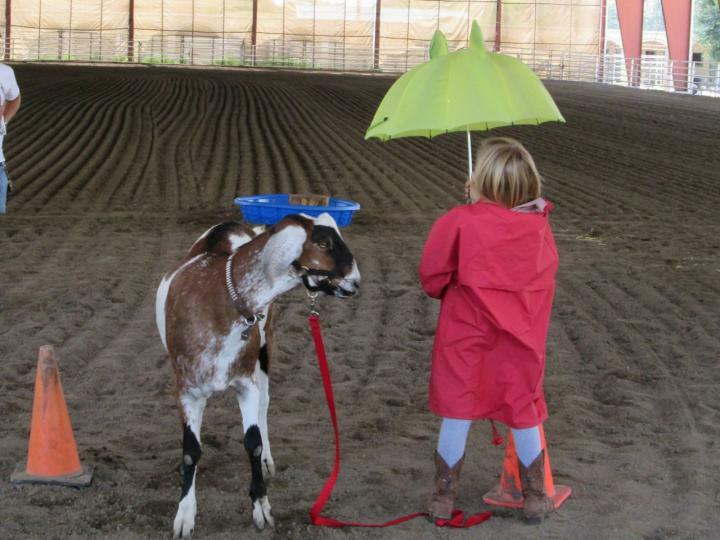 Drop the rope on the ground (kid could step on it to hold goat in place if necessary), and put on the raincoat and open the umbrella (goat should not spook). 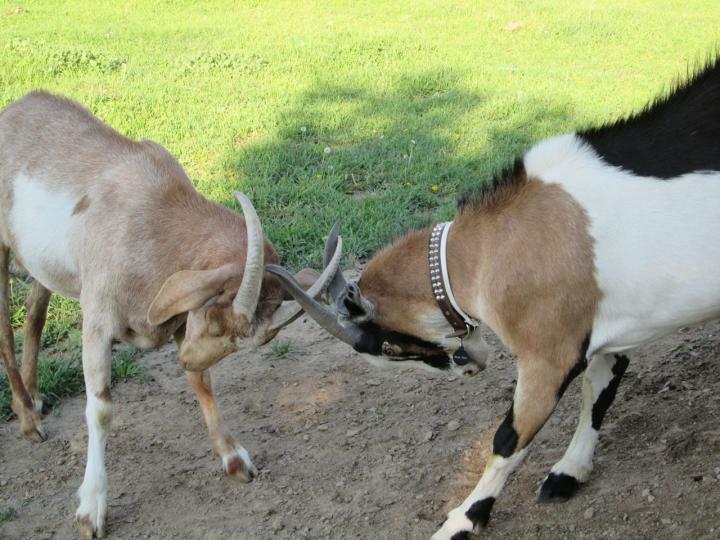 Demonstrate ground tying by walking around the two cones the goat is “parked” between. 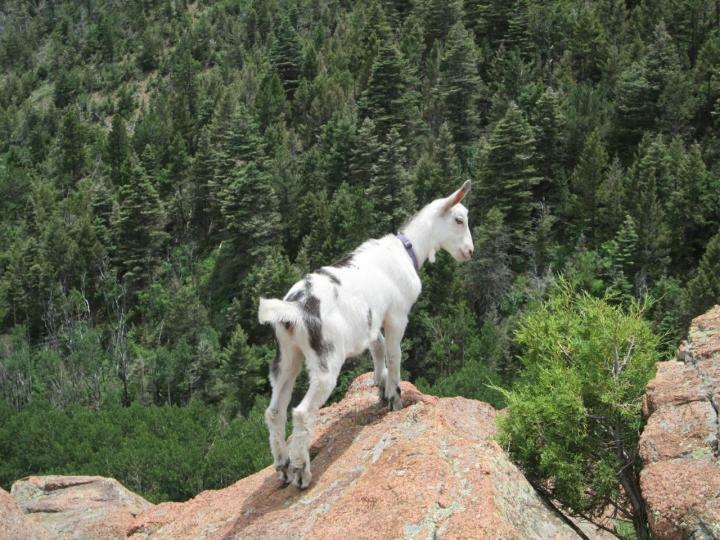 Goat should not move. Remove raincoat and close umbrella. 3. Narrow bridge – This was a board 12 feet long and 12 inches wide set between two straw bales. A support in the middle kept it from sagging or breaking in the middle. 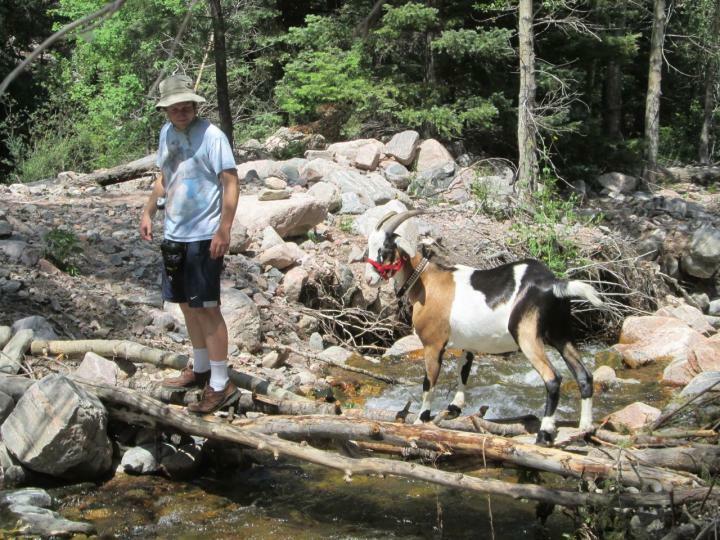 Handler could walk on the bridge or beside it, but the goat had to cross the whole thing. 4. Water crossing – Kiddie paddle pool half full of water with a stump in the middle. 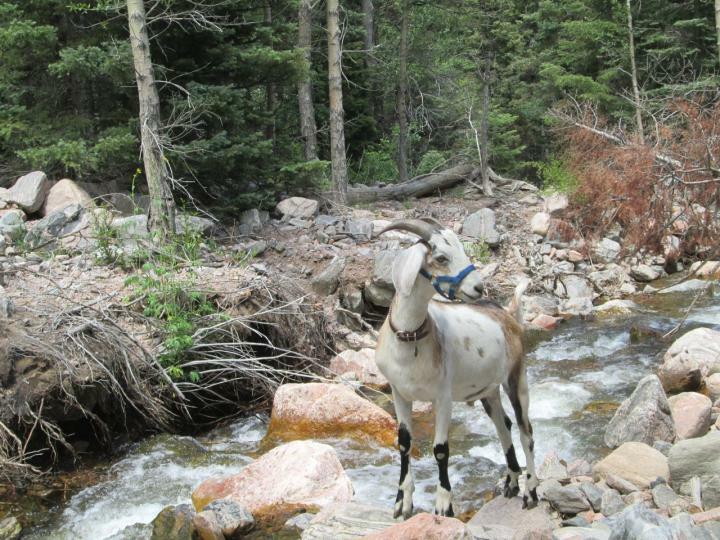 The goat could step in the water or or use the stump to cross or a combination of both. 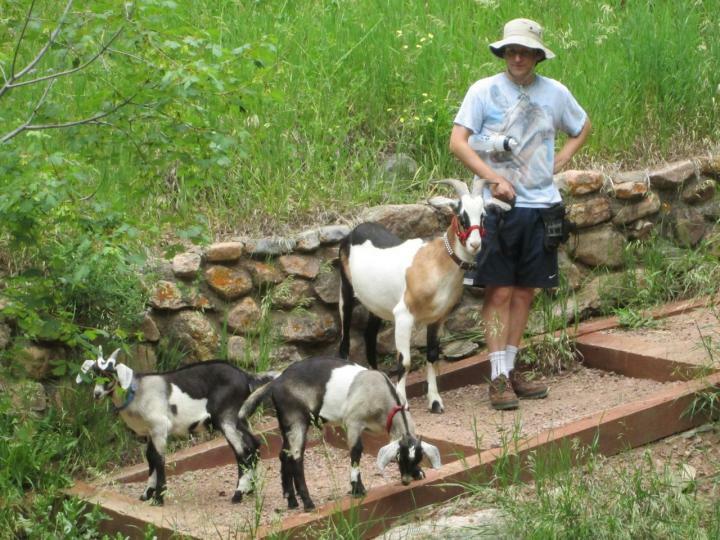 I put some arena dirt in the bottom of the pool to give traction for goats who stepped into the water. 5. 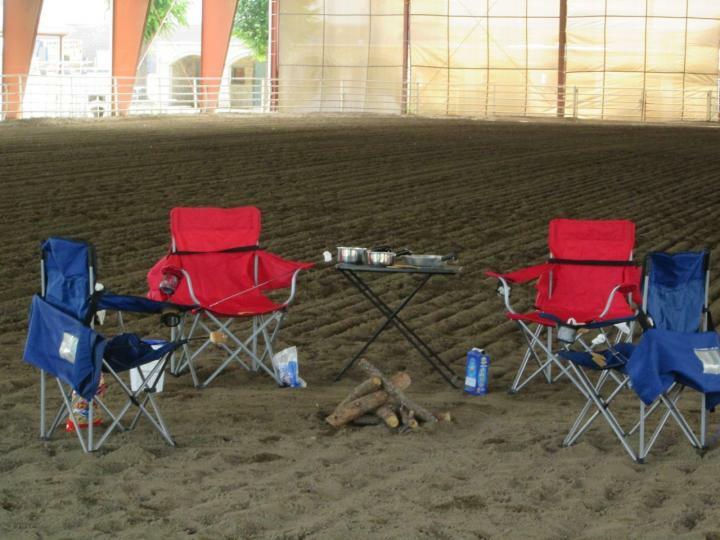 Campsite – Chairs and camp table arranged around a “campfire” with various tasty food items scattered on the chairs and table. 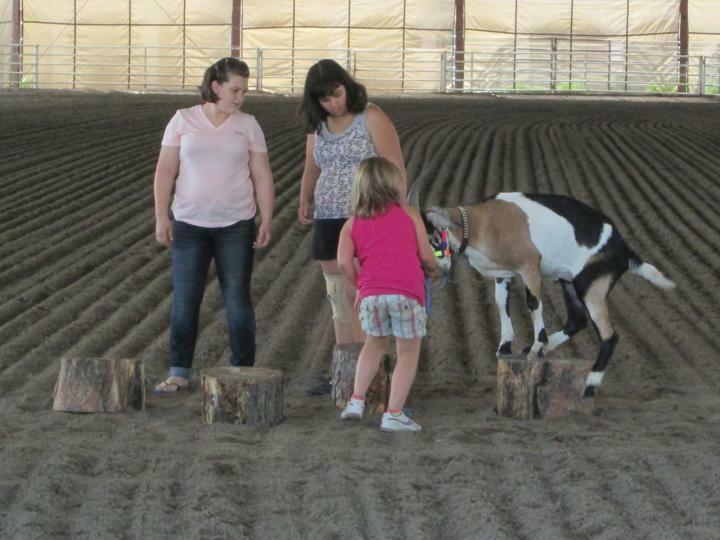 Goat had to walk in a circle between the chairs and the campfire without snatching anything or bumping into chairs or campfire wood. 6. 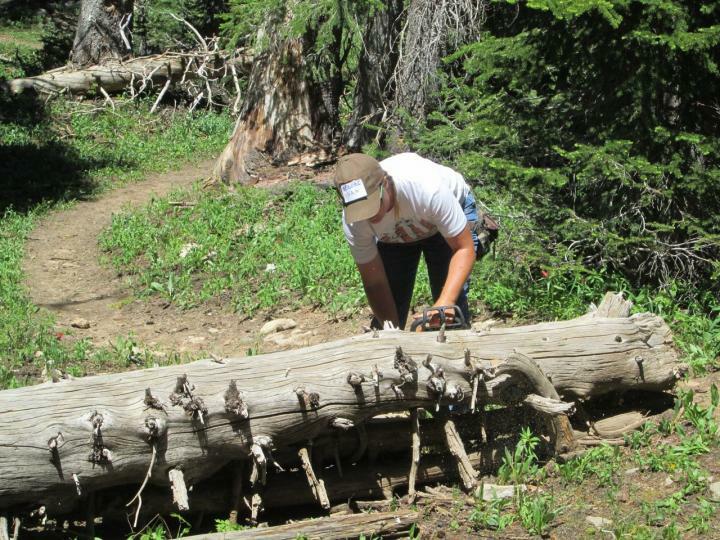 Stepping stumps – Four stumps spaced about 18″ apart in a zig-zag pattern. 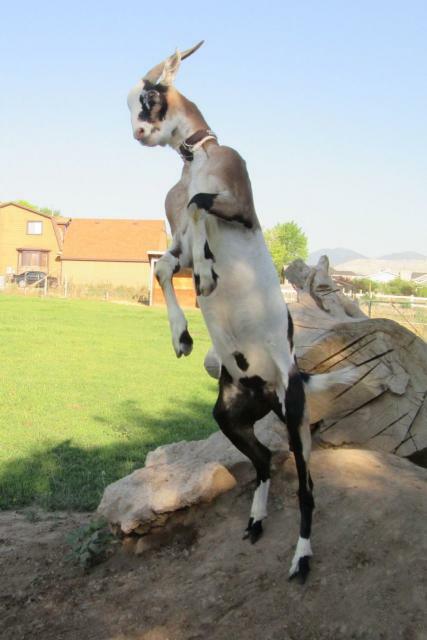 Goat should hop from one to the next without touching the ground. Well, he learned to pack kids, that is! On July 4th Phil and I spent the day at my parents’ house where a lot of other friends and relatives were gathered for the holiday. We had Finn and Pac-Man with us that day and while my mom saddled up her pony for the kids to ride, I saddled up Pac-Man. We didn’t do it very long… Pac-Man is only two years old, and the saddle doesn’t fit him very well. He’s much too round for a normal tree and has no withers, so the kids had to balance well to keep the saddle from rolling. 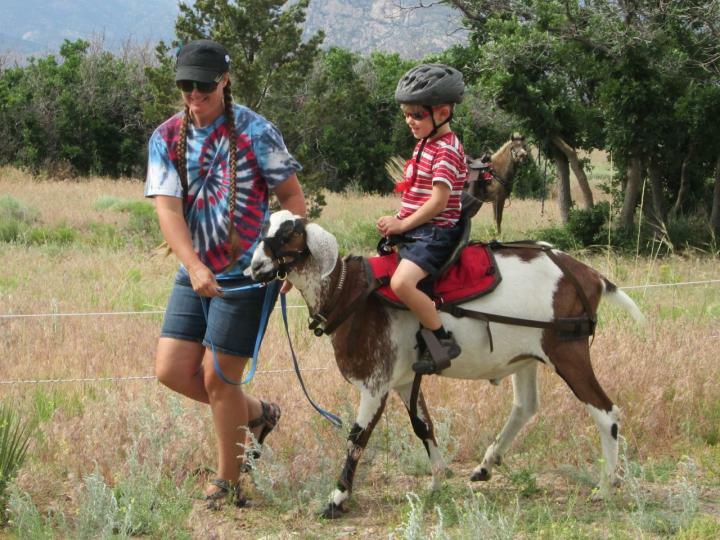 Still, we had a great time, and my nephew, Robert, was thrilled to get to ride a goat! Pac-Man was a sweet boy and seemed to enjoy the experience. My niece, Lily. I don’t think she’s having quite enough fun. Do you? 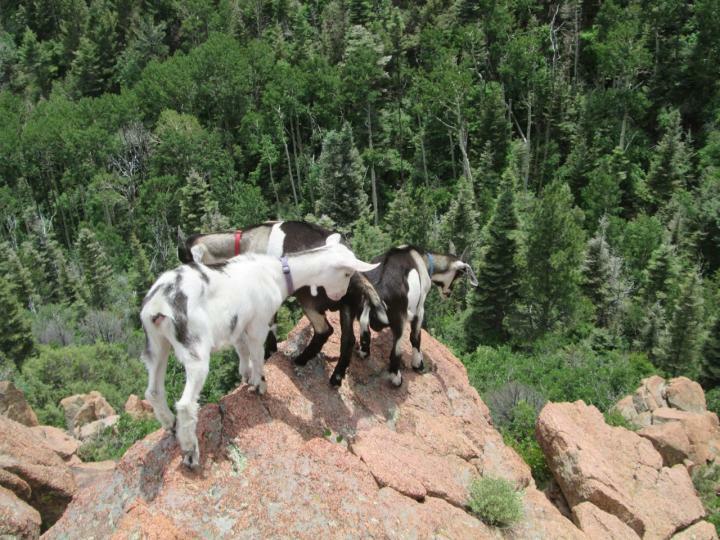 We took Finn, Snickers, Sledge, and Hammer for a hike up the Greenhorn Trail today. 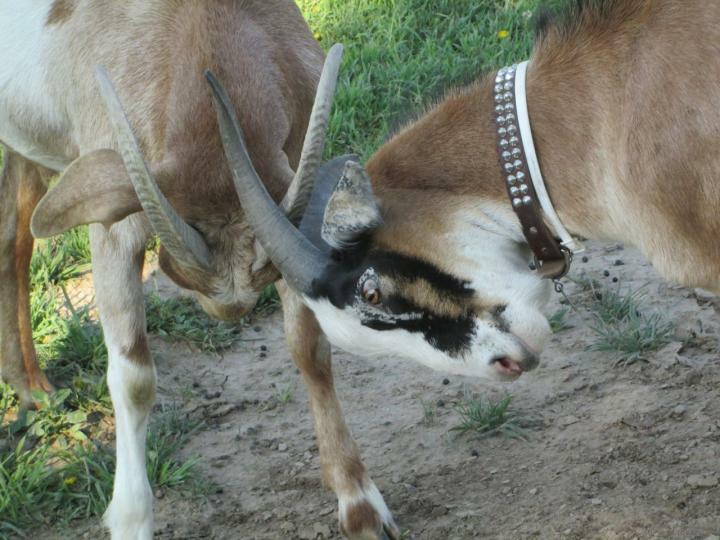 This was Sledge and Hammer’s first time out. They cried at first, as babies tend to do when you pull them away from mommy, but they seemed to enjoy themselves and quieted down by the end. 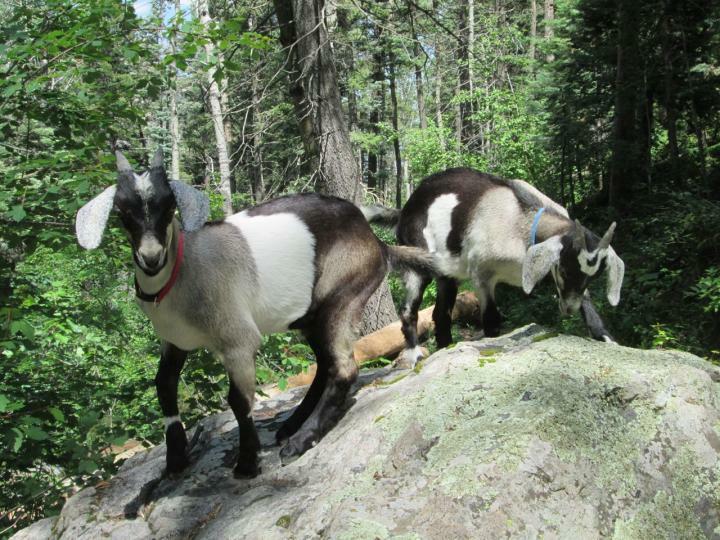 Finn and Snickers provided a good example of how packgoats should behave on the trail, although we had to teach a few lessons about not cutting past people. Finn was especially determined to get past me so he could follow Phil, so I swatted him in the nose with my hat every time he would try to sneak past. It was pretty effective, but not always, as you can see from this picture. Phil with Finn and his boys. They sure do look a lot like their papa! The little guys really liked this big rock. 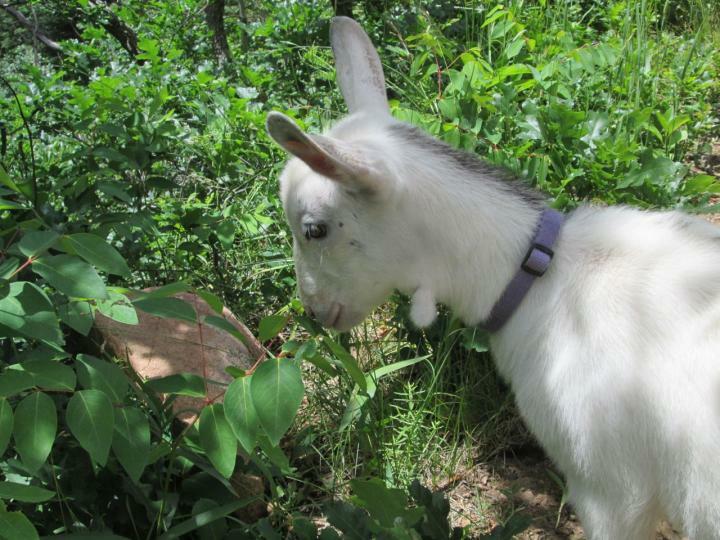 Sledge discovered that the best part about hiking is the wide variety of delicious foliage. Snickers is a good, good boy on these hikes. He simply loves getting out and doing stuff with us, and he has no qualms about crossing creeks, logs, bridges, stepping stones, or anything. I get the feeling that even if we met a bear, he would stop and look at it briefly before calmly walking behind Phil or I. 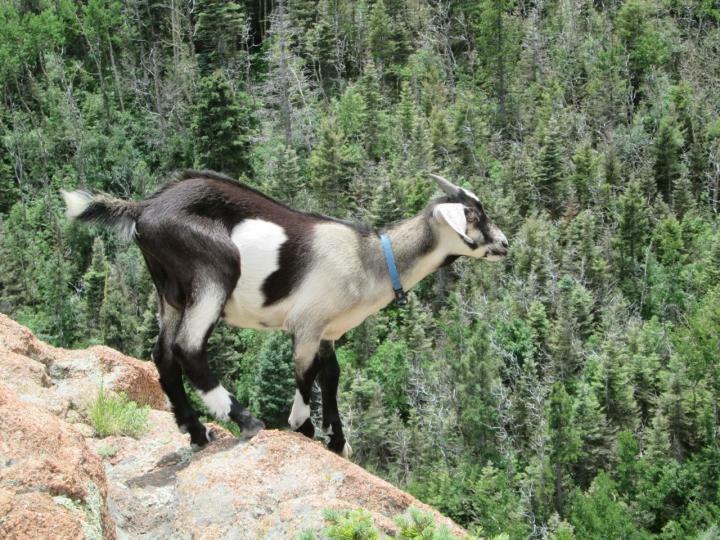 He doesn’t act like a bold, adventuresome goat, but he seems unflappable. 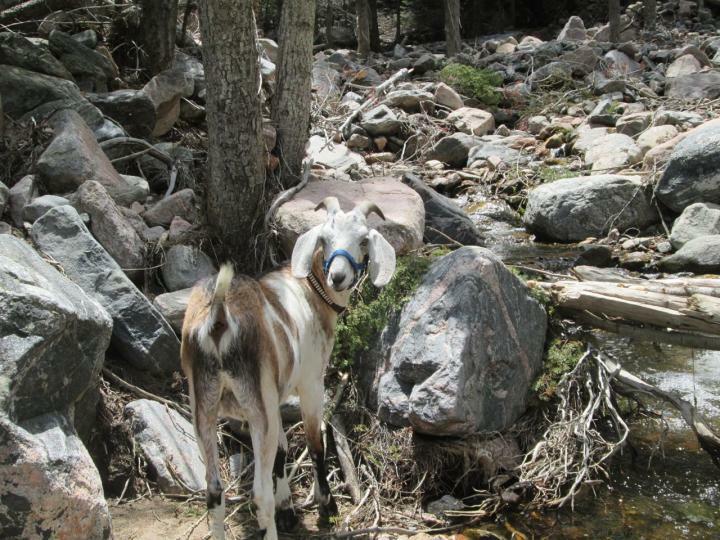 And he blends in nicely with the scenery as long as we’re walking along a rocky creek bed. Finn boldly goes wherever Phil goes, and although he’s out of the shot, Snickers casually strolled across this rather unstable log bridge as well. It consisted of a lot of small, wiggly, sagging logs sort of loosely bundled together, and it was pretty high over the creek. 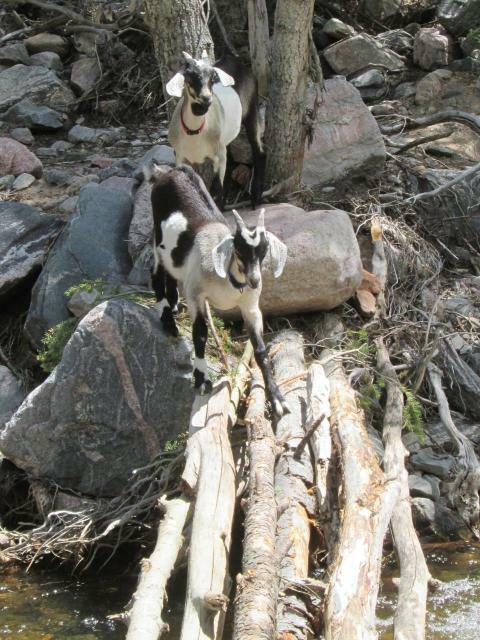 I wasn’t sure it was safe for the goats to cross (Cuzco would have walked through the creek at this point), but they made it. Except Sledge and Hammer. This proved a bit much for them and after walking on it myself, I’m glad they went no further than this before turning back. The spaces between the logs were pretty large in spots and the water was deep and swift enough that the babies might have been swept away had they fallen. 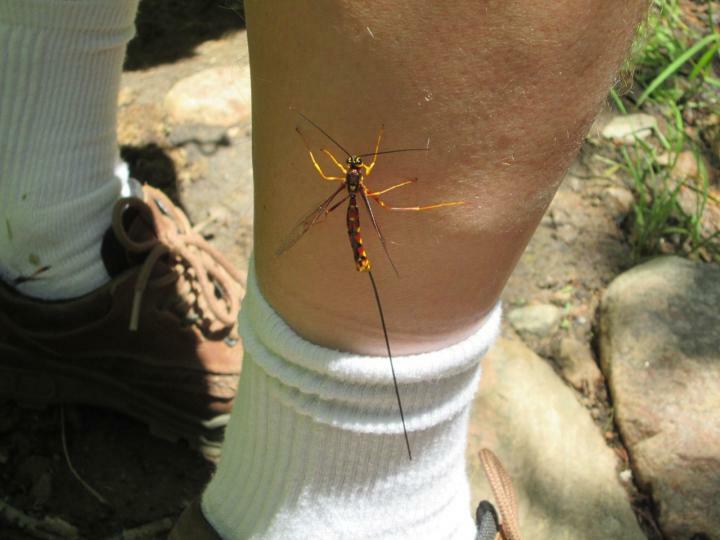 We also met this cool bug on the trail. It liked Phil’s leg apparently. Phil liked the bug, but he wasn’t sure he wanted it crawling on him. I kept telling Phil not to move so I could get more photos while the bug kept ticklishly crawling dangerously higher. I did not let the bug go up into Phil’s shorts, but that probably would have been the most entertaining part of the hike if I had. I can’t resist posting a few of these photos. 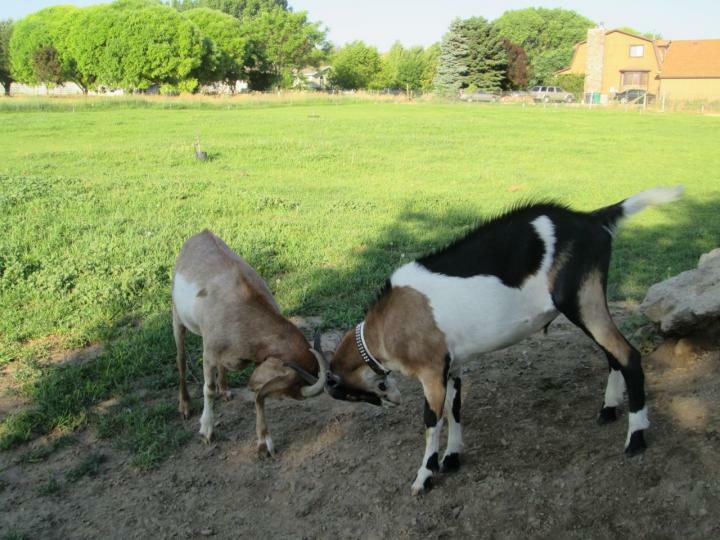 Throwing two herds together into one pasture for a night is bound to raise some excitement, and our goats spent a good deal of time sparring with Herb’s. 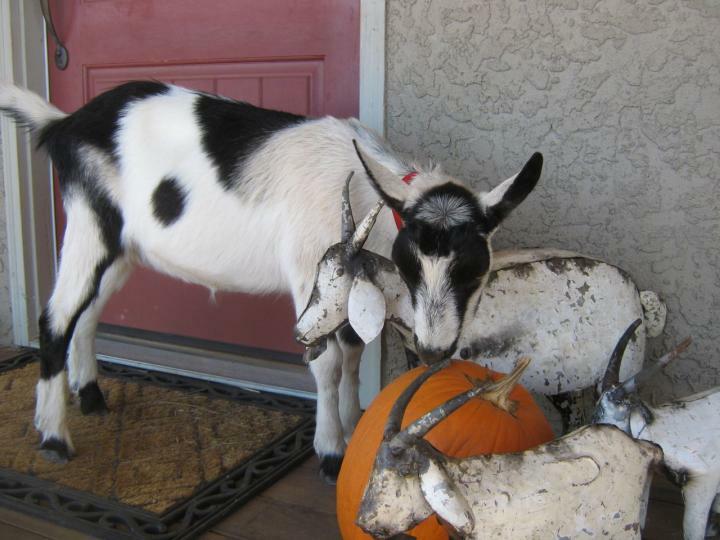 Finn was trilled to clack horns with Bacchus and Woodstock, Herb’s only horned goats. Bacchus proved a bit much for Finn and the fight was soon over, but Woodstock and Finn were quite well matched and the duel dragged out long enough for me to take far too many pictures. Saturday night was a real treat. There were only a few items not purchased in the store which had to be auctioned. Several of these items ended up fetching more at action than their original asking price! I ended up with the entire left-over stash of homemade goat cookies that Cuzco was so fond of. 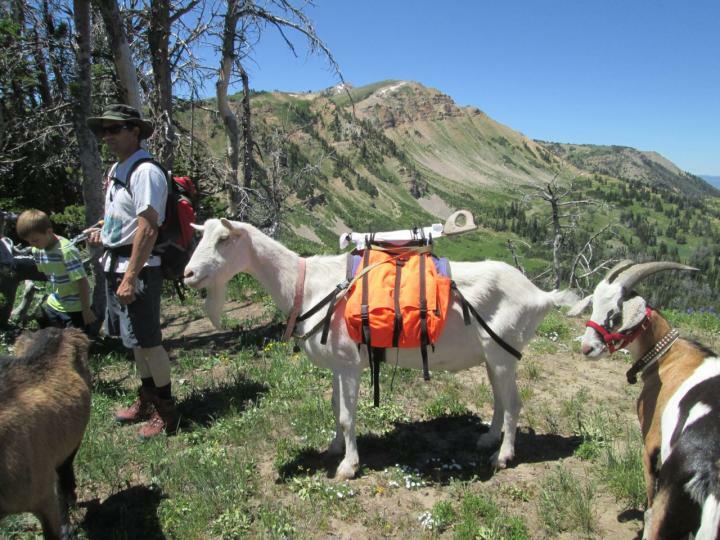 Afterwards, John Mionczynski told the fascinating story of how he got into goat packing and showed us his first packsaddle which he fashioned himself from a couple of barn boards and a shovel handle. He also brought several other examples of early packsaddles and panniers and treated us to “goat songs” he composed on his old Swiss squeezebox. 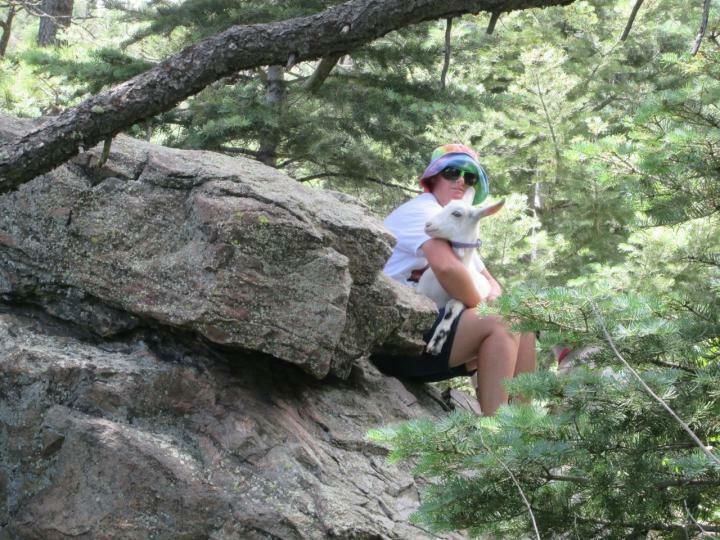 I brought Cuzco to the campfire so he could enjoy the music with us. Phil also jumped in on his fiddle and it was quite a treat. All things must come to an end and it would have been sad to pack up on Sunday morning except for the fact that Phil and I were looking forward to a visit with Herb (aka Charlie Horse) on our way home. He had been unable to attend the Rendy, but we arranged to stay with him Sunday night as we traveled through Salt Lake City. 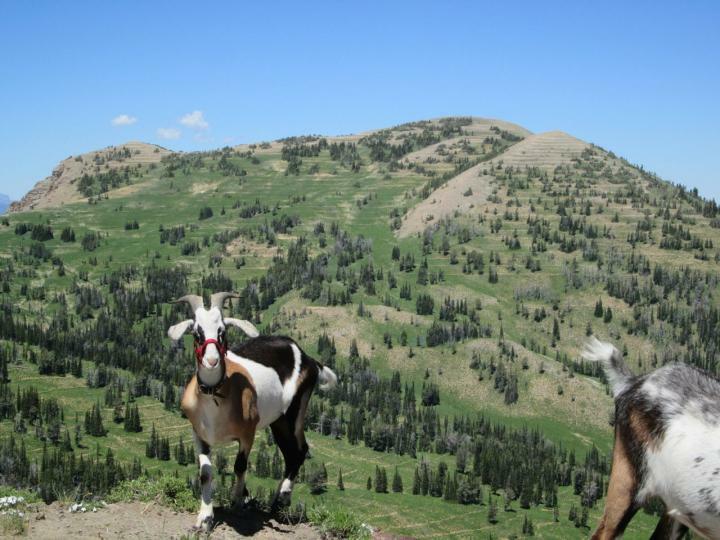 Herb has a bunch of goats, some of whom we met at the 2013 Rendy. 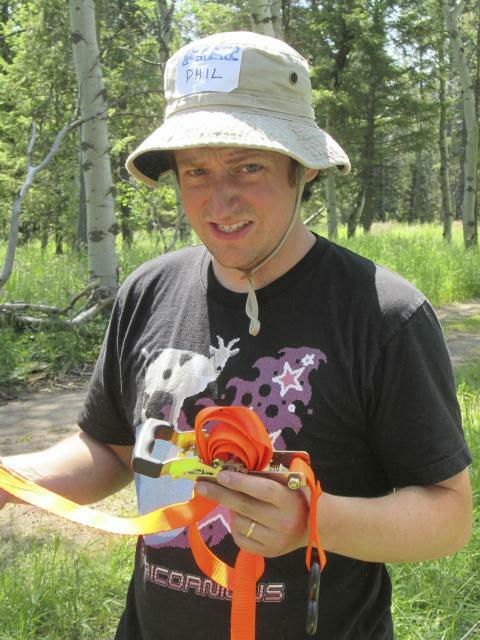 But before we left, Phil had a fight with a tavern puzzle… er, tangled strap tie. 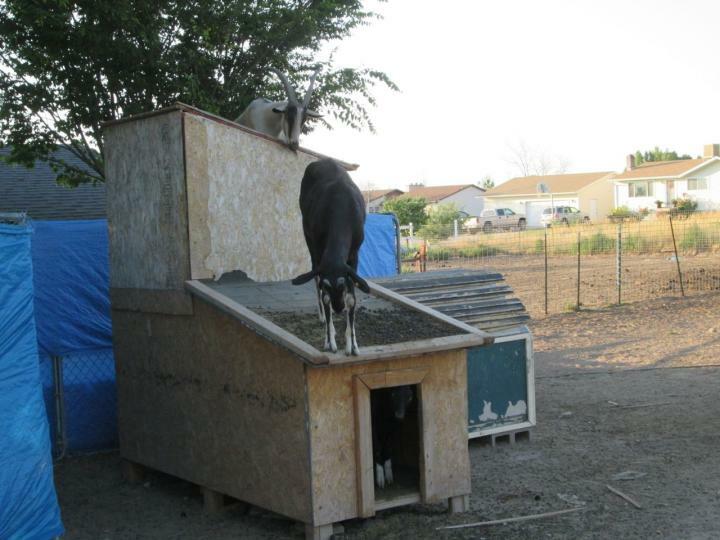 Herb has a great goat shed that the goats can climb on top of. 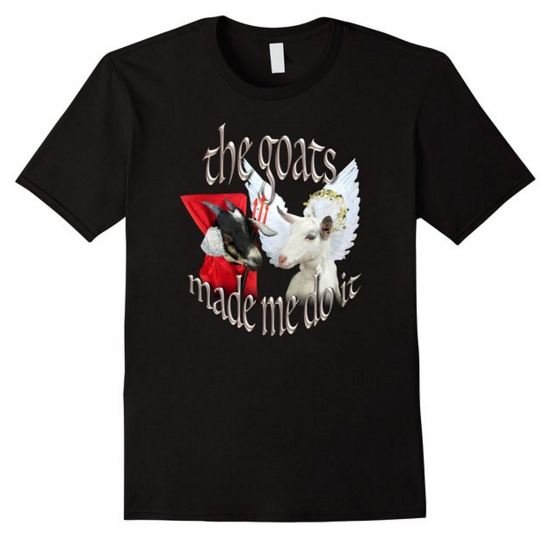 Check out the triple-goat action here! …and he viciously defended it against all invaders both real and perceived. 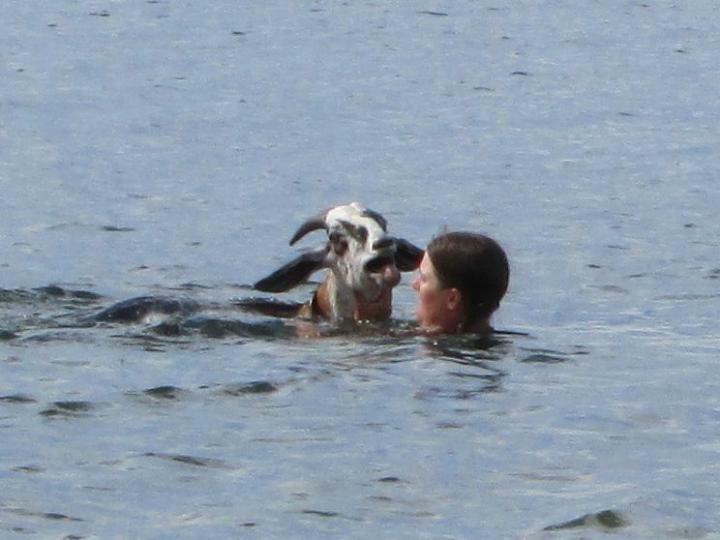 A few of us decided to drive over to Lake Henry for a swim on Saturday and I brought the goats. 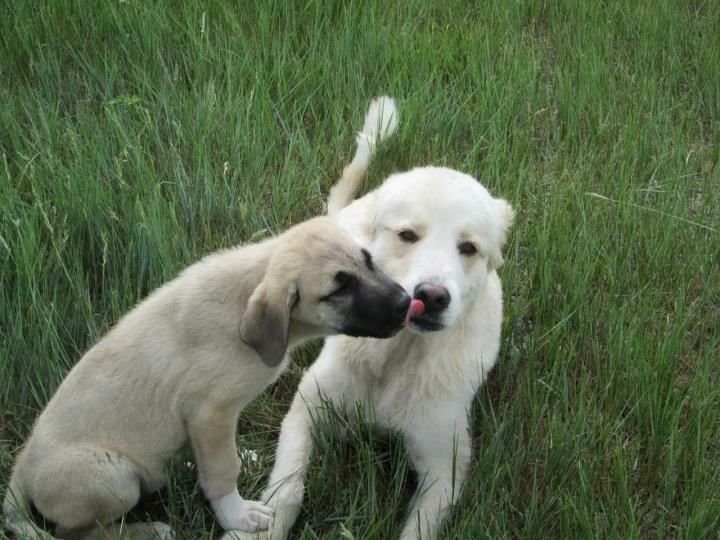 Cuzco, of course, swam at the 2013 Rendy, but I wanted to introduce the younger boys. The water was perfect–a very nice temperature and an easy, gradual slope with a solid sand and gravel bottom. Finn and Snickers balked at first, but they figured it out rather quickly and were soon following us into the water and swimming without hesitation. Sputnik was a different story. He bawled at the top of his lungs the minute the water hit his chest, and he didn’t stop even when it went over his head. The result was that he ended up with facefulls of water which got into his mouth and nose and caused him to splutter and scream some more. 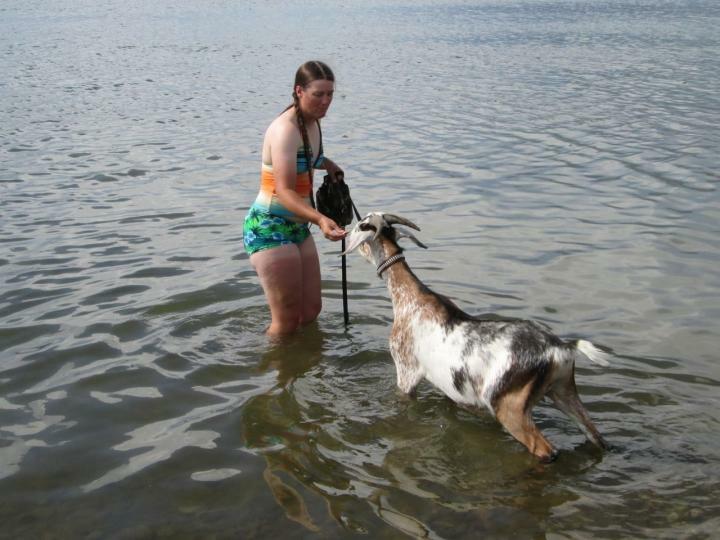 The silly goat was so busy yelling that he wouldn’t kick his legs and promptly sank when the water got deep. I had to buoy him along until he settled down enough to figure out that if he just kicked his legs instead of bawling about the unfairness of life, he could float just fine. “Come on Sputnik!” He went fairly willingly to this point. 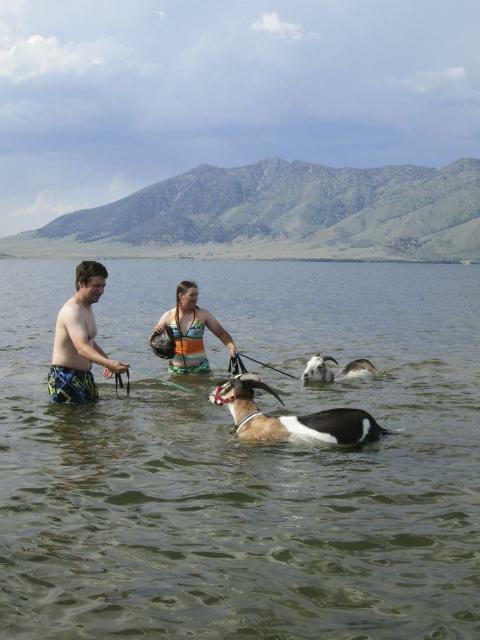 Finn and Snickers handled the water sensibly, and Finn even got to enjoying it I think. A close-up of Sputnik’s panic-stricken face as he floundered in the deep water. I was holding him afloat at this point. We took a short video of Sputnik’s (very loud) ordeal. 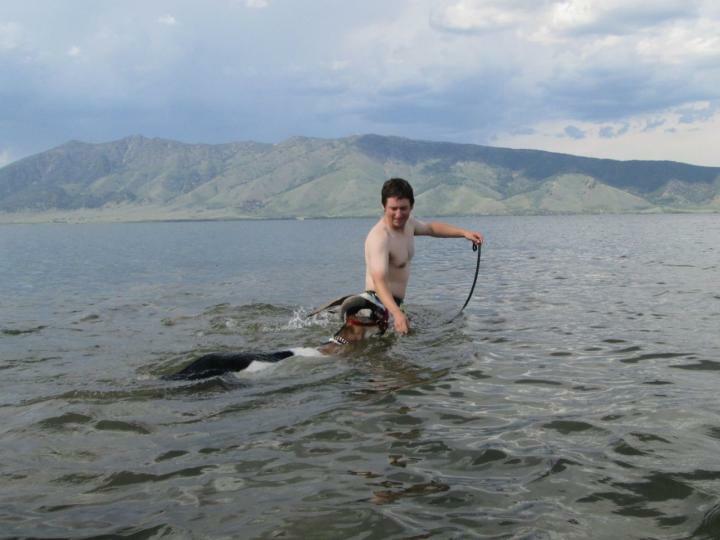 He was convinced I was deliberately drowning him, but I promise I wasn’t! 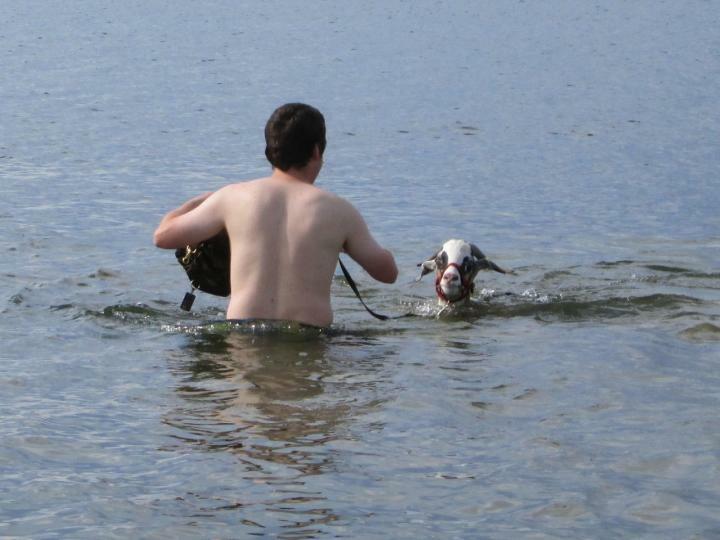 In fact, I was the only reason he stayed above water for the first few minutes! Sputnik’s bottom aside, I loved this mountain with its terraced slopes. Apparently the snow would build up and then melt all at once and flood the plain below every spring, so terraces were dug in the mountainside in the early 1900’s to slow down the water flow. 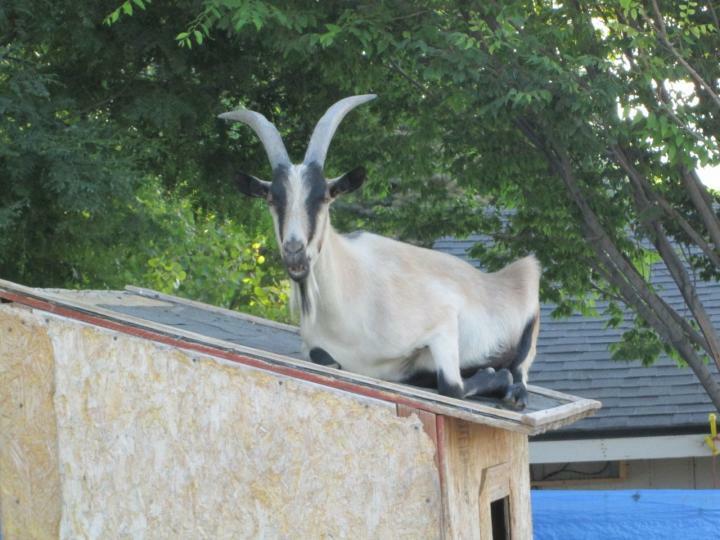 I can’t remember whose goat this was, but he looked very classy with the saw perched on top! Look at that grin on Cuzco’s face! We didn’t have many logs to clear, so when I finally broke out the chainsaw to remove one it was a major event. 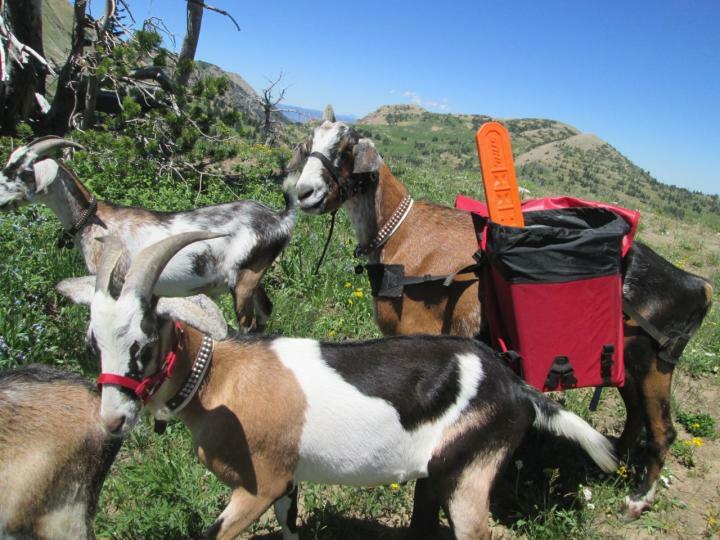 Cuzco was thrilled to have the all-important job of carrying the chainsaw, but when we turned back toward home I decided that there was no need for the old fellow to wear himself out–not when there were several much younger goats on the hike who were perfectly capable of taking his load. So we gave the chainsaw to Romeo to take back to the trailhead. He did an excellent job. 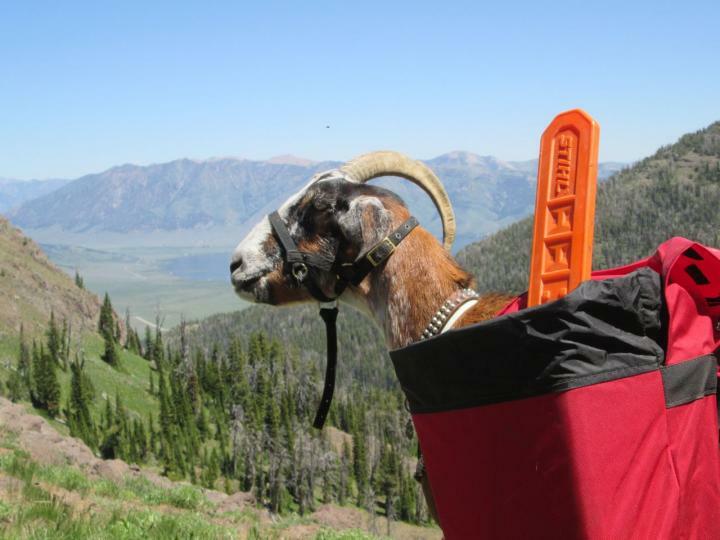 Cuzco still wore his pack so he wouldn’t feel snubbed, but he carried it mostly empty. 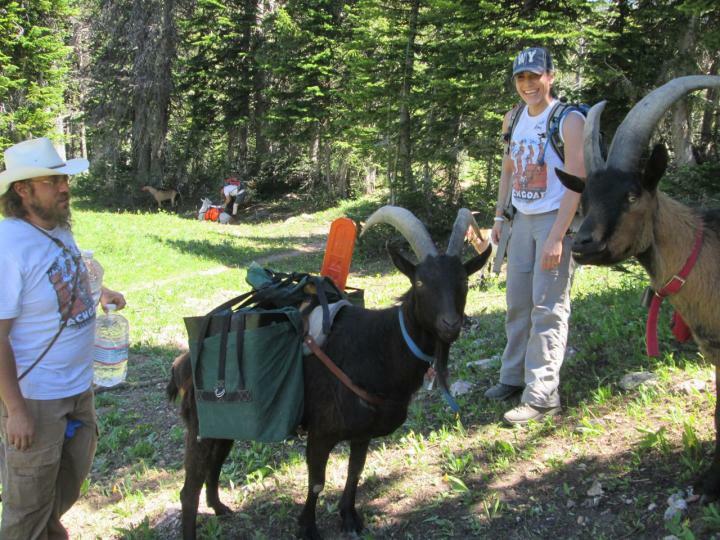 I love the toothy grin on that goat on the right! 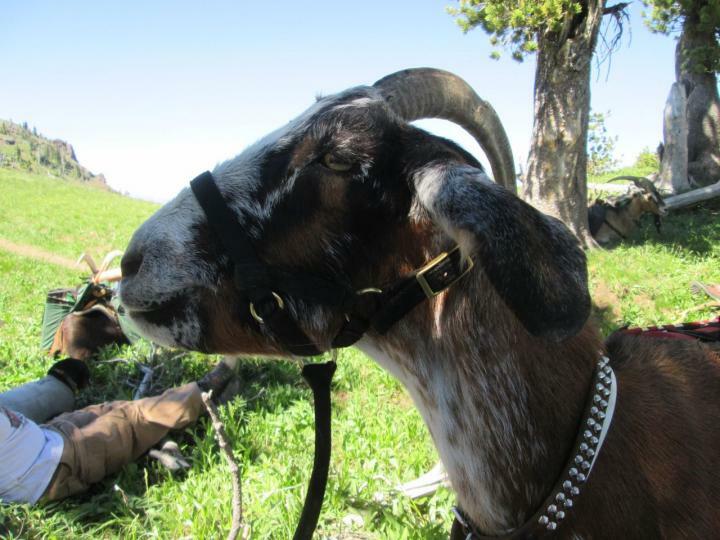 I can’t resist ending without a picture of Cuzco striking a regal pose. He had every right to be proud of himself that day. He carried a respectable load on a hot day over rough terrain and never lagged or complained even though he’d spent two days previous riding in a trailer. What a good boy!